RIGHT WHERE WE BELONG: Welcome Home, Abby! 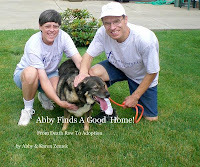 Today when we went to visit Abby at the vet's we got a nice surprise--they let her come home with us! Hooray! We are so happy to have our dog back home and she is on the mend and that the other dog owners, who are nice people and very sad this happened, paid the $3,000 bill. (Gerard doesn't look very happy in this picture because he just watched his Boston Bruins blow the game.) That patch on her back end is to ease her pain--it released pain medication through the day. The drain tubes and patch will be coming out on Monday. She still needs to wear the clunky cone for about another week until she gets her stitches out to keep her from licking them unless we are watching her closely. We were able to take off here blue bracelet tonight. She is eating like normal now and made some very nice poop on her short trip outside after supper. She is not allowed to do stairs though so Gerard has to carry her up and down our front steps. Also, the leash is very flimsy and soft, more like a lead. She is not allowed to go for any real walks yet, just in our yard to do her business and get outside for a little while. At least Gerard won't have to get up as early. We are so glad you're going to be okay, Abby! She has three different medications that we give her with her meals and we have to keep track of how much she eats, how much more drains out from her and how much poop she makes. I have a notebook set up. I have a new admiration for vet technicians who keep track of all the medications their patients need. I have just one to keep track of and it's not easy. We appreciate the many people who prayed for us, especially for Abby. These pictures don't even show all the damage that was done, but thank God, she survived! 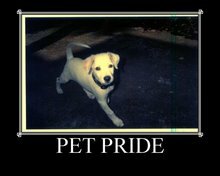 Visit Pet Pride for more pet posts or link one up of yours. Oh, Abby, how dreadful for you. 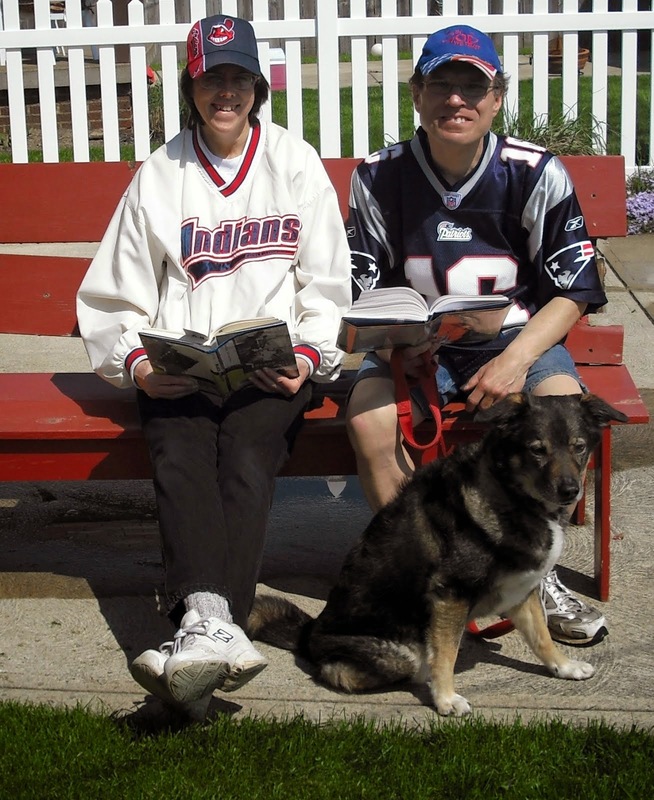 Lindy can't imagine being attacked by Rottweilers, and neither can her mom and dad. We can only try to understand how all of you must feel. And then to have the Bruins let you down, too, is almost more than a hockey fan can take. Get well soon, Abby. Lots of people are praying for you. Heya Abby good to know you are back home now and on the road to recovery! Take care! Get well soon! Holding good thoughts for you..
Yay for Abby coming home on Sadieday! We know she'll be so much more comfortable at home with her mom and dad and kitty furblings! We're glad the dogs owners are being so easy to work with because we're sure they are very upset with what happened too. We're continuing to pray for Abby to heal up soon! Hope Gerard's hand is better too! I'm glad Abby is home. We're glad Abby's home. It's not easy on the caregiver. Sending lots of comforting purrs. Everyone's stress level will be down with Abby at home. I'm sure she feels safer now. I'm so happy Abby was able to come home today, and she is continuing to heal well. It sounds like you guys have a great veterinary clinic, and I'm sure the power of all our purrs have been helping! So glad that Abby was able to come home already and that the other dog owners are paying your bill. Hope that Abby mends up real good and fast !! How lovely to see Abby home! Those wounds do look dreadful but Abby looks to be well on the road to full recovery. Glad she is on time released pain medicine. We bet that helps a whole lot. And we love that home coming picture of Abby with her kitties! sono molto dispiacita per l'aggressione al tuo cane... sono contenta che adesso stià meglio e che sia potuto ritornare a casa con tutti voi che l'amate ! E' moklto triste tutto ciò !! Oh that is such good news that Abby got to come home. She will probably heal a lot faster being at home. That is so terrific that the people that owned the dogs paid the vet bill. Lots of purrs and woofs coming for ya Abby. For Gerald too. Hope everyone feels better soon. I'm so glad that Abby is back home and on the mend. She must be so happy to be out of the hospital! We are so happy that Abby got to come home. We are sending healing purrs that she continues to heal rapidly and comforting purrs for the pain. I hope your dog recovers fully soon. Abby, we're so thankful that you're home! We will continue to pray for your recovery - and for your dad's, too!!! PS: You're in Parma? Our dad grew up in Lorain! HA rooo!!! here from beaded tail's blog. so glad Abby is recovering! I'm so glad to read Abby's home and getting such good care and loving from you and Gerard. I worry about Abby's mental state, as well as her physical one. What a horrible trauma for her to suffer. Oh, this makes me so mad that this happened! Take good care of yourselves and I wish for many more good poops on Abby's part! Oh, our poor little buddy! I feel so bad that it happened to her! I hope she recovers her trust in the world again. We read the post on the attach and are very sorry Abby and Gerard were hurt. (It sounds as if the dogs were euthanized?) So glad Abby pulled through and that Gerard only had the one bite. One is enough! We send pawhugs to your family for both to have a complete and speedy recovery. I'm so happy to hear that Abby is home with you. What a horrific ordeal for all of you. My thoughts and prayers are with you for a quick and uneventful recovery!